An initiative for a Yemeni political settlement has been presented to the Houthi faction and ex-president Ali Abdullah Saleh loyalists, a source close to Saleh told Ahram Online. 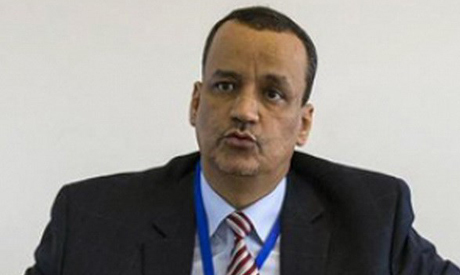 The written initiative was presented to the two allied factions by UN envoy Ismail Ould Cheikh Ahmed, who visited the Yemeni capital Sanaa on Monday, according to the source. “The UN envoy left before receiving a final reply in hopes that he will be back in a few weeks to prepare a fresh round of talks for a settlement if an initial approval is given,” the source said. The new initiative includes six main points, the first of which is for Yemeni President Abd Rabu Mansour Hady to be recognised as a transitional president with limited authority, and the appointment of a vice president agreed upon by all involved factions and who is to be based in the capital Sanaa, currently under Houthi control. The second point is the sacking of current Vice President Ali Mohsin Al-Ahmar following the signing of the settlement accord, and the third is the formation of a consensus cabinet from both sides within one month of the agreement. The fourth point is the amending of the constitution that was in place before the Houthis took power in September 2014, while the fifth is the holding of elections under international supervision after one year. The sixth point is the withdrawal of the Houthi forces and their allies from the major northern areas – Sanaa, Taiz and Al-Hudaida – with the stationing of security and military checkpoints in all governorates to oversee the withdrawal. The source added that the Houthi’s are amenable to the initiative with the exception of the proposal to keep Hady as president as well as the stipulation related to the constitution, which states that Yemen is a unified state under a single authority. Another source close to Saudi official circles confirmed from the Saudi capital of Riyadh the authenticity of the reports, stressing that the Houthis and the Saleh faction refuse the condition of Hady staying in power. It is notable that the proposal did not include the surrender of heavy weapons by Houthi forces, as once pushed for by US Secretary of State John Kerry’s initiative. The new plan focuses mainly on the managing of the security situation in Sanaa, Taiz and Al-Hudaida, and fails to include the northwestern city of Saada in the equation. Saada is the main stronghold of the Houthi rebel movement. This means that the movement will have to retreat to the city in a fashion similar to what was offered to the Lebanese Hezbollah group in accordance with the Taif agreement. The Taif agreement, signed in October 1989, was reached to end the Lebanese civil war following mediation efforts by Saudi Arabia stipulating the disarmament of all national and non-national militias; where Hezbollah was allowed to stay armed. Regarding the initiative’s proposed one-year transitional period and the issue of Houthi disarmament, political analyst and media figure in Riyadh Khaled Alyan told Ahram Online that he does not believe that the transitional period stipulated is long enough. Alyan gives an example of the previous elections, which witnessed a crisis in the electoral lists. “This issue alone – following the current war – would take more than a year. This comes in addition to the procedures related to elections and their preparations, as well as other problems like territories where the Houthi-Saleh alliance refuses federal state governance,” he says. Ahmed Rafik, who is a member in the leadership circle of Yemen’s General People Congress Party founded by former president Saleh, says that the conflicting parties may reach a settlement within the next month. Rafik predicts that there will be another round of fighting before a lasting settlement is reached. “What we need to currently acknowledge... is that Saleh has a problem with Hadi; therefore he insists on his deposal as much as he insists on the removal of General Al-Ahmar,” Alyan said. He added that Saleh’s problem is a political one that can be resolved through some guarantees from the Gulf states, especially from Saudi Arabia, that he or his son can return to the political scene in the future. Alyan said that regarding the Houthis, things are more complicated. Commenting on disarmament, he said that Houthis cannot surrender their arms, as this is what brought them to power in the first place. They can agree on the transfer of power, but not disarmament.